Brandi, I sure don't blame you from taking a break from posting It gets to a person, and you are lucky to have the talent to do what you do with pictures and avatars. I wanted to ask you this first, I want to take Zoe's picture down, every time my daughter walks by she gets very upset, and so do I. You have made so many beautiful avatars for me with Zoe, I will always appreciate it beyond words. I don't want you to be insulted at all, and under the new avatar I'm planning on using a little statement about Zoe, even though I don't know how to do it. I have a picture picked out of a pair of rose colored glasses with one of the lenses shattered, and since that expresses my life to a tee I was wanting to use that. 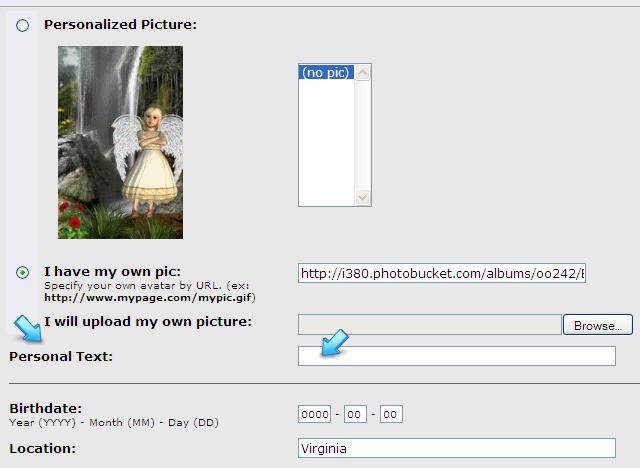 My daughter when she gets home later is going to put it in the photobucket, I'm sorry I just don't get how to do that. If it is alright maybe you can add some psychedelic colors in the background. I want to thank-you again for all the hard work you have done on all of Zoe's pictures, they have made me smile and cry and brighten up my life. I completely understand, no rose. If you would like, your daughter or you can just email me the picture you want to use, and I'll see what I can do with it for you. I have thoroughly enjoyed doing Zoe's avatar the past couple of years and maybe some day you will like to put it back up, so I will be sure to hold onto all the ones I made. I'll show you how to add a comment under your avatar as well. I'll work on it as soon as I get it. Just made your Fall avatar too. I used the same format with the window in it. I think you'll like it! I am here. Always tending to this thread. Am taking a little break from posting in other threads right now. Take care, and visit anytime!!! I can't wait to see it and I just know I'll love it! I love every change of clothes you make for me! And I definitely understand the need to take some time away from the threads. Tends to be overwhelming for me at times, as well! I hope you don't stay MIA for too long though! Is that waving guy one of your creations? I love the shadow! Cool! Well, this is what I could come up with featuring your glasses and a psychedelic background. If you don't like any of these, tell me! And I'll try something else. None have any animation. I thought it would be too hard to see the glasses if I animated them. Give me your honest opinion and I'll be more than happy to work on whatever you think of! I also have some other rose colored glasses that I shattered for you in case you want me to work with a different pair of glasses. Oh! To add some words under your avatar, go to Profile/Forum Profile Information/Personal Text. Put what you want there. Then scroll to the bottom of the page and click: Change Profile. Three more before I go to bed. This is the original one you sent me. I just changed the tint of the glasses from purple-y to more rosy. Just in case you prefer a neutral background. Oh Brandi how wonderful, you read my mind with the peace sign I love all of them, thank-you. As soon as my daughter leaves for work I will put it up and the saying under it, thanks for showing me how. You just did it again! I'm going to buy stock in Kleenex tissues! You are WONDERFUL Brandi! I was just working on a Fall design for your avatar. I seem to make you cry a lot. LOL I just added the tears to your monkey. Maybe I should buy stock in Kleenex? I love it when you come by and visit me here! I'll be posting Fall avatars soon. I'll wait patiently for my new fall avatar. Thank you sweet Brandi! Wow, Brandi, I just love your work. You really have a great talent! I am with Sassifrass on those Kyron photos. Absolutely marvelous!!! 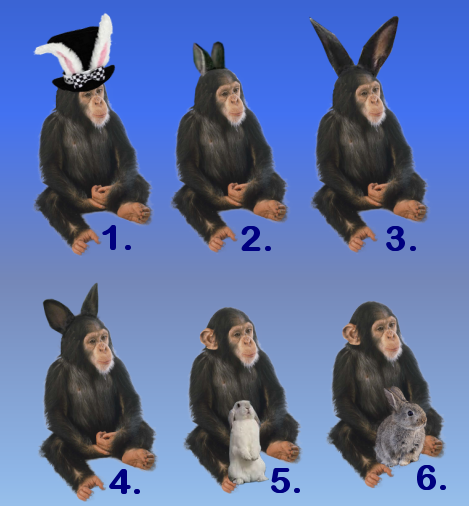 I hope it is not an impossition to ask, but would there be any chance of getting an avitar with a monkey with bunny ears? I raise rabbits and it is such a huge part of me, but I am a monkey now too. lol. I guess I'm one of those silly identity crisis kind of gals. Thank you. How can a human being start out as an innocent baby and turn into a monster that would harm an innocent baby? Brandi, what beautiful designs for NoRose. I too will miss seeing Zoe's picture, but I love the saying under the new avie. Do you make any of the little emoctions or whatever they are called? I have used so much the monkey angel and was hoping we might get a new one -- somehow related to prayer or blessings. My imagination today is nil. I realize they would be for everyone to use, which would be fine. If you can't do these, that's ok -- I so enjoy coming here and looking at your creativity. It's a breath of fresh air. I spent a few hours working on yours, but realized that I need your input. I made some with bunny ears, then thought, what about this hat? Then thought, what about a monkey and a bunny together? Made the monkey and the bunnies blink for ya, and animated some falling leaves. Let me know which number (if any) you like and I'll work with those for you and design a few selections. I made this one especially for Tevye: which is the most religious of any I have made. I believe Klaas had made most of the other special ones on the forum. It's probably best that you ask Klaas for a praying hands icon and she can go find one out on the web to use. It is her decision which icons get added to the forum board. If I get time, I'd consider making you a special one for your use. But right now, I am a little busy with Autumn avatars. I'll let you know if I come up with something for you. Your angel wings are a personification of your soul. We adore you and your art! Oh, Brandi! I love them all!!! I really like the white ears on #1. Am I a total pain??? LOL. You are awesome! Page created in 1.659 seconds with 19 queries.